With metal prices at record levels, now is the time to cash in on your precious metal investments. 650-GOLD is one of Cleveland's leading buyers of investment gold, silver, and platinum. Older US coins such as Liberty and Indian dollars. Canadian Maple Leafs, South African Kugerrands, Chinese Pandas, British Britannias, Mexican Gold Pesos and other foreign gold and silver bullion coins. 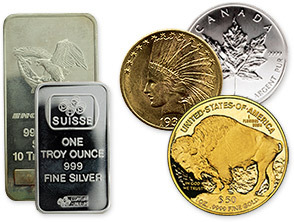 Gold, silver and platinum bars from private refiners such as Credit Suisse, Johnson Matthey, Engelhard, PAMP and others. Turn your gold, silver or platinum into cash today. Stop by our convenient Northeast Ohio location, or call 216-650-GOLD for more information.